The Hearth Tax was introduced shortly after the Restoration of King Charles II in 1660 to raise money for the many debts and expenses of the new administration. It was levied on every hearth (also known as the chimney tax) as a fair means of ensuring that the tax would fall most heavily on the wealthiest, and was payable by the occupant of the house. Those in receipt of assistance from the Parish were exempt, but only on production of a certificate. 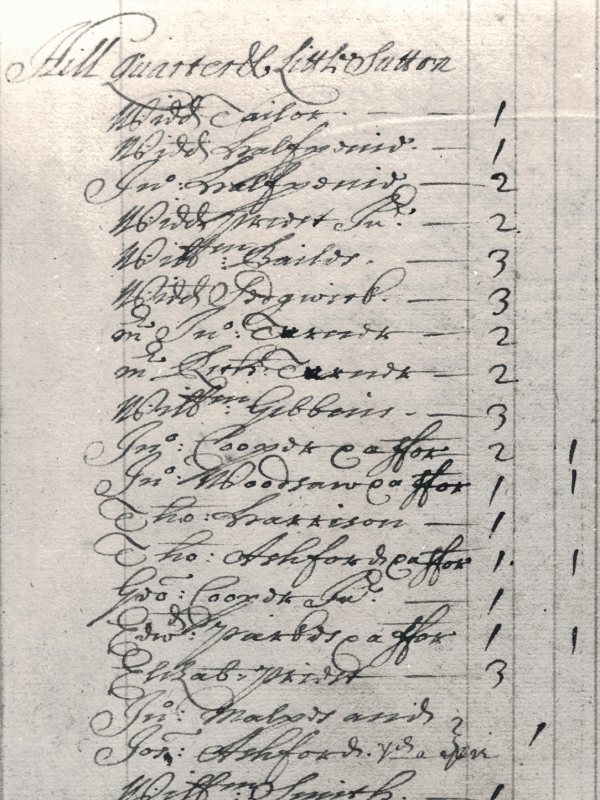 The tax returns for Sutton Coldfield survive for several years, listing all the occupants by name; the total number of names for 1674 being 311. The tax collector scrupulously identified the gentry in his lists by giving them the honorific Mr. or Mrs, and analysis shows that twelve percent of the households were headed by gentry - in most parishes gentry comprised five to ten percent of the households, so Sutton must have been an OK address. Conversely, paupers made up thirty-five percent of the Sutton households, compared with a national average of thirty percent. The Hearth tax records show how the population was distributed - where people lived. The taxpayers are listed by Quarter, an administrative subdivision of the town dating back to ancient times. The Quarters were geographical areas, and there were five of them. The town centre was in Great Sutton Quarter, which included Sutton Park; the good houses were in High Street and Coleshill Street, while the cottages were huddled together at the bottom of Mill Street; in 1663 there were 63 taxpayers, 22 of them paupers. There were 40 householders in Maney and the Wylde Quarter, to the south, most of them living near Maney Corner, with a few at Wylde Green (top of Wylde Green Road) and one or two isolated farms; 12 were paupers. The houses in Walmley and Beyond the Wood Quarter were at Walmley Ash, Wigginshill, and Greaves, with smaller settlements at Thimble End, Grove End and Over Green; 10 of the 44 taxpayers were exempt. There were several large houses in Moor and Ashfurlaong Quarter, which stretched from Moor Hall to Penns Hall including the Rectory, with cottages at Reddicap Heath and near Rectory Park; 20 of the 51 taxpayers were paupers. 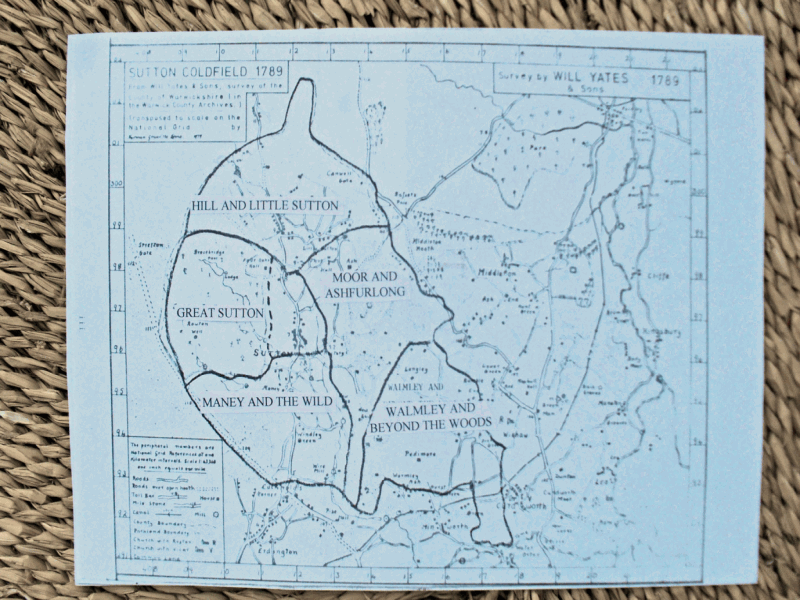 The most populous quarter was Hill and Little Sutton, with 91 houses, mostly in the ancient nucleated hamlets of Hill (Hill Village Road) and Little Sutton, but with a fair number at Four Oaks (near Four Oaks Gate to Sutton Park), Hill Hook and Roughley - 31 paupers in 1663. Representatives of each Quarter gave a report to the twice-yearly Court Leet. This was a court which had hardly changed in 500 years, where each inhabitant was supposed to be present and swear an oath of loyalty. Actually, two representatives from each Quarter, known as tithingmen, Headboroughs, or Thirdbarrows, took the oath on behalf the whole population of the Quarter. Tithingmen were elected annually at the court, along with the Constable, and these eleven officers constituted the watch which would police the fairs and markets. Approximate boundaries of the Quarters of Sutton. Facsimile of part of the Sutton hearth tax return for Hill and Little Sutton Quarter for 1674. The figures in the right-hand column indicate forges, which did not pay tax.